T1 Diabetic ramblings, with a special interest in the Abbott Freestyle Libre Glucose Monitor...and perhaps some totally unrelated musical thoughts. A response I guess...but rather disappointing...especially from the second largest CCG. Thank you for your letter dated 18th March 2019. I have attached the current BNSSG CCG response to the Freestyle Libre Device enquires. This is the most up to date information that we are currently able to offer. The CCG website will be updated as actions are agreed. 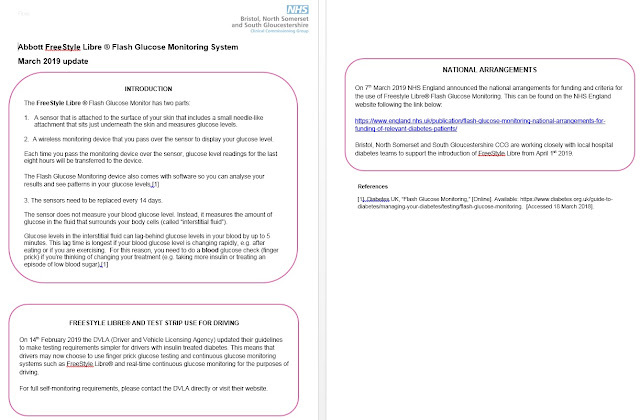 In order to find out the situation around the country for Libre prescribing now that the national policy has been published, I have made the decision to contact many of them to find out their plans. 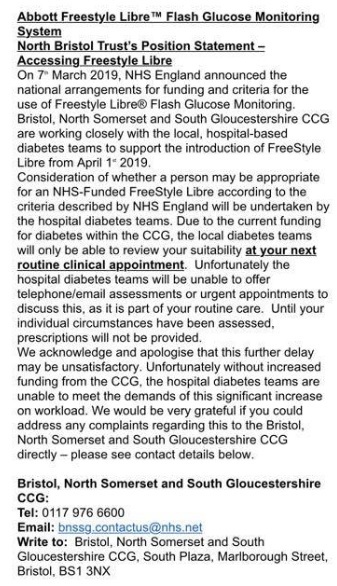 I have arbitrarily chosen to contact all English CCGs that in December 2018 prescribed Libre via Primary Care to less than 5% of their population (and one specific request from a group member). I had hoped this would be a small list, but there are 135 CCGs on the list. I may have bitten off more than I can chew, but I'm committed to doing this and feeding back. It worked before and hopefully this level of scrutiny will bring similar results. Below is a screenshot of the base document I am sending to each of the CCGs - it has some fields that are merge fields, so don't worry about the brackets and codes in the document (I found a typo, which has now been corrected too).